Today the pound is the currency of Guernsey, however it wasn’t always this way. It’s only since 1921 that Guernsey has been in currency union with the UK. 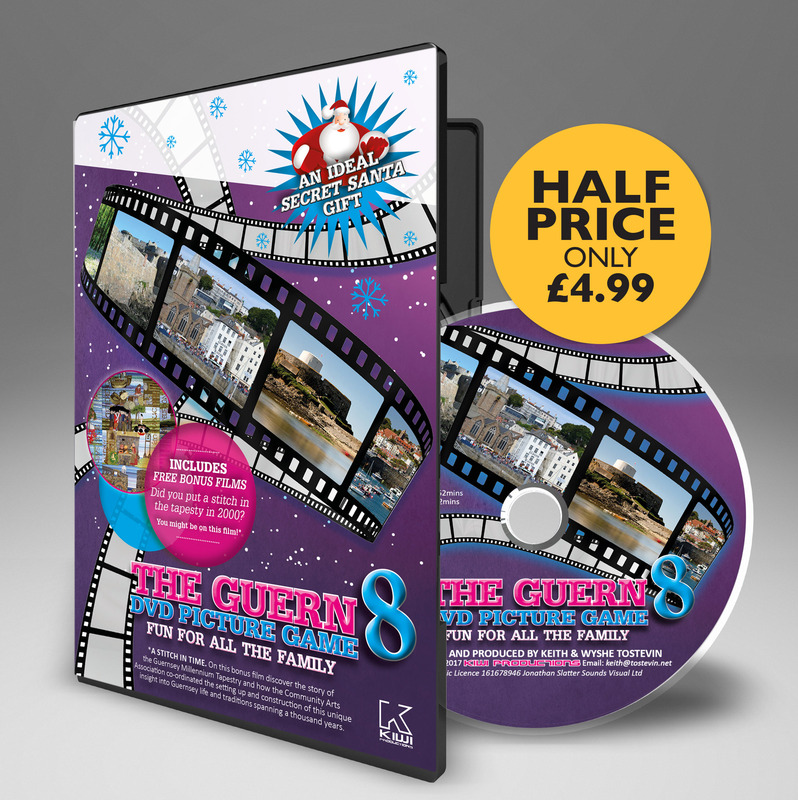 This means that the Guernsey pound is not a separate currency but is a local issue of banknotes and coins denominated in pound sterling, in a similar way to the banknotes issued in Scotland and Northern Ireland. However even after 1921 there was a curious anomaly, the Guernsey Double, which carried on in circulation for another 45 years. We look here at these curious ‘little’ coins … The Guernsey Doubles. Until the early 19th century, Guernsey used predominantly French currency. Coins of the French livre were legal tender until 1834, with French francs used until 1921. However in 1870, British coins were also made legal tender, with the British shilling circulating at 12½ Guernsey pence. Bank of England notes became legal tender in 1873. In 1914, new banknotes appeared, some of which carried denominations in Guernsey shillings and francs. However after the First World War, the value of the franc began to fall relative to sterling. This was the trigger that caused Guernsey to adopt a pound equal to the pound sterling in 1921. In 1971, along with the rest of the British Isles, Guernsey decimalized, with the pound subdivided into 100 pence, and began issuing a full range of coin denominations from ½p to 50p (£1 and £2 coins followed later). The Guernsey Doubles (pronounced doobulls!) were a coinage unique to Guernsey, although Jersey had similar small value coins and were first struck in 1830. Doubles were issued alongside coins equivalent to UK denominations. 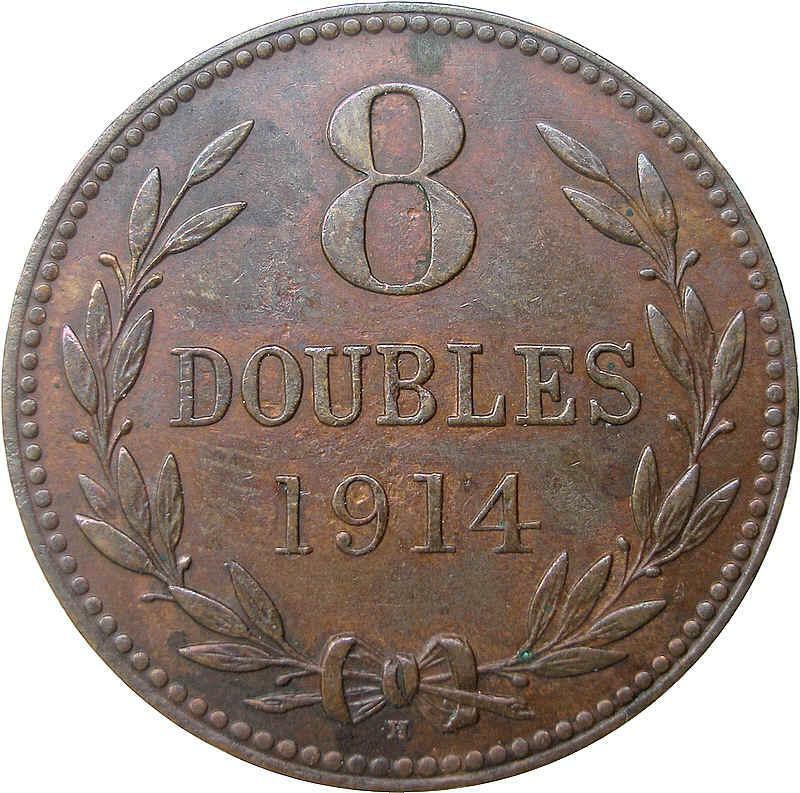 Eight Doubles were equivalent to One Penny In UK currency. 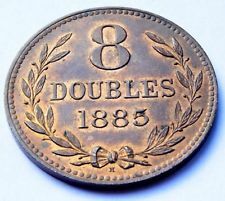 Eight Doubles coins were issued, along with Four Doubles (equal to one Halfpenny), Two Doubles (equal to one Farthing) and One Double (one eighth Penny). All were initially copper coins. The Four Doubles was the earliest copper coin minted for Guernsey in 1830, during the reign of William IV. The Eight and One Double coins appeared first in 1834. The Two Doubles coin was first struck in 1858. The Eight Doubles coin was based for its first issues, in size and weight, on the British Penny. When after 1860, the Penny coin was reduced in size and struck in bronze, the Eight Doubles coin followed suit. The Four Doubles was correspondingly reduced as well, but the Two and One Doubles continued unchanged. The Eight Doubles and Four Doubles coins were then issued virtually unchanged until 1949. The first Elizabeth II issues of 1956 were a redesign. This design continued until the coins were discontinued in 1966. No Two Doubles coins were struck after 1929, but the tiny One Double continued to be issued until 1938, despite its very low denomination. None of the coins ever portrayed the Monarch’s head. All denominations showed on their obverse the Arms of Guernsey (three lions) within a shield; and their value on the reverse, together with the date of issue. Some issues bore a Guernsey Lily on the reverse too. If you want read more about how and when the Guernsey States issued their own currency then refer to our article entitled Beating the Bankers at their Own Game – the Guernsey Way.